While travel from one location to another has long been a facet of everyday life, the dream of travel throughout time has always captured the imagination of mankind. Whether to adjust historical events or simply see the world as it was in a different age, time travel contraptions have been dreamt up and portrayed on both the small and large screens. Though the methods through which these machines are capable of overcoming space and time differ in some regards, there are some principles of science that must be abided by in order to transcend the fabric of time. While time travel is a fantasy outside of human capability, there still remains the matter of figuring out just what it would take to make it a reality. Above all else, just how much energy would it take to successfully punch a hole into space and time? Though time machines have come in a number of shapes and sizes, several have emerged as the most popular forms of going back in time. The means by which this is done can range from power source to the understanding of time as a concept, ultimately leading to some interesting methods and machines for travelling to the past or the future. This sleigh-based machine was able to travel through space and time as the user simply had to adjust a lever and could move to either the future or the past. As time travel occurs, a large plate on the back of the machine spins while the user is left exposed and the world around he or she ages. This is mainly based in fiction as the science is not explained and the machine has no grand display of energy use. It is worth noting due to the fact that it serves as one of the early attempts at visually representing time travel, though the matter of powering the machine is glanced over. After a subsequent head bump while hanging a clock, Emmett Brown first began formulating a method for travelling through time through the use of a machine powered by the now famous flux capacitor. Originally Doc had made several attempts at time travel but their capability was limited due to the buildup of flux energy which would overheat the capacitor and cause a fire. 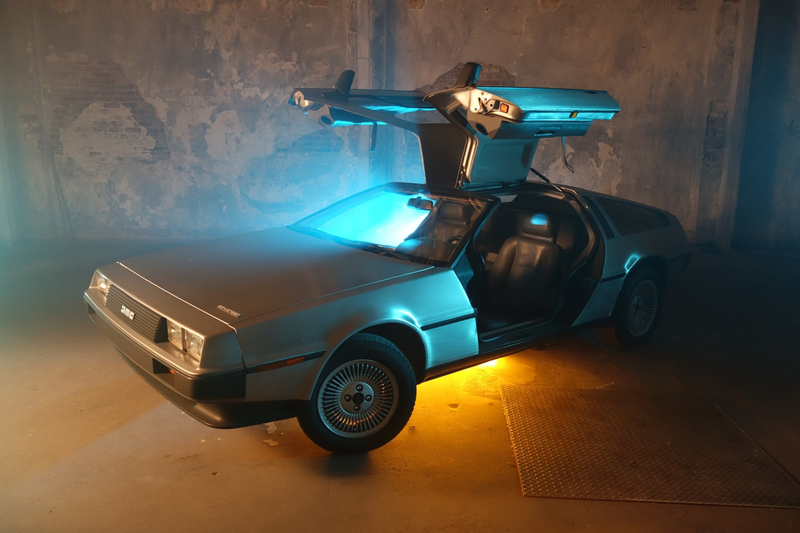 When Doc perfected the technology, he put the capacitor within a DeLorean DMC-12, which was then fueled using plutonium. Requiring 1.21 “jigowatts” of power in order to punch through the confines of time, the DeLorean also had to reach a speed of 88 miles per hour. When using the time machine however, a careful eye had to be kept on the fuel gauge as running out of plutonium could leave one stranded in time. Though the Tardis (Time and Relative Dimension in Space) appears to be an unsuspecting police phone booth from the outside. In reality this time machine has an interior housed in a separate dimension from its exterior, enabling it to be much larger internally. There is a lot of mystery surrounding the exact science of the Tardis, though some physicists believe the key to its travel is the creation of a closed time curve. Normally time moves in a straight line but when space-time is warped and folded in a closed circle, one can move forward and backward in time. This would only allow for circular time travel, though taking several loops and combining them together would enable the Doctor to tunnel through time, as seen by the Tardis’ path in later theme songs. As theorized by renowned physicist Albert Einstein, the ability to travel through time is in fact possible. Unfortunately, time travel in reality is not the same as it is in fiction and there is no means by which an individual could to trek to events from the past and return to the present. Instead, time travel is a matter of relativity according to Einstein. In his theory, the scientist stated that the speed of light represents the limit at which objects are capable of moving. When, however, an object is moving at the speed of light relative to surrounding objects, the effect of time changes as it will move slower for that object in motion than for others that are still. Holding this theory as being true, if you were to leave the earth and to travel at light speed for several years, when you returned home you would find that the world had moved ahead decades. Instead of having gone back in time, the effects of time would have been reduced, enabling time to move more slowly for you than for the rest of the universe. Instead of traveling back or forwards in time, you would have traveled through it. The manner in which time travel was conceptualized by Einstein has been affirmed by others in the scientific community, causing some to question whether or not it is possible today, given our technological advancements. The answer to that questions is yes, as one field allows workers to travel through time, often unbeknownst to them. For astronauts who remain within the atmosphere for several months, not only are they released from the effects of gravity, but they are temporarily granted a microscopic slowdown of time as well. This has to do with the high speeds at which they orbit the earth which may not be nearly as quick as the speed of light, but is enough to slow time for them relative to those still on Earth. It is important to note that even staying in orbit for one to two years will only result in an insignificant leap through time (<.01-.02 seconds), but individuals are still able to emerge a bit younger. Given that a space shuttle is our closest mechanism for travelling through time, the amount of energy required to enter and stay in orbit is the most comparable to what it would take to power a time machine. In order to power takeoff for a space shuttle, roughly 12 billion watts of power would be necessary. From there, an object has be brought to the Earth’s orbital speed which, in the case of the International Space Station, is 17,500 miles per hour. In the event you were hoping to build a time machine in real life, you would need several important things in order to construct a means of going to the future. On top of an understanding of the intricacies of space and time, a shell that can achieve and withstand incredible speeds is necessary. Due to the fact that the speed of orbit will not allow a noticeable difference in time even if you remain, you’ll require a method for achieving and maintaining an even faster pace. In the event you were hoping to get a better understanding of what building a fictional time machine that is capable of going to the past and future entails, you’ll need to further push the boundaries of physics. Such a machine would require a component that was able to bend time in on itself. In order for this to be achieved, that component would need to have a dependable fuel source capable of generating an essentially incomprehensible amount of energy. Even in its portrayal within popular media, time travel is no easy concept to wrap your mind around. Trying to figure out a method for actually achieving it in reality is infinitely more difficult, even given the fact that we are aware of what such travel would involve. The greatest obstacle keeping us from making leaps into the unknown future is the fact that currently such innovations are beyond our world. Though we may never be able to tap into the fantasy that is time travel, it will never fail to capture the imagination and keep many believing that the past and future are not set in stone. Time travel may not be possible beyond a certain extent, but it is still fun to imagine what it could allow us to do. To find out how much energy it takes to power other devices or find a provider that supplies it affordably, visit paylesspower.com. Offering cheap energy plans to suit both personal and business needs, Payless Power is a company committed to providing people not only with some of the best cheap electricity rates in Texas, but also with helpful customer service. Visit the website to learn more about how to save electricity at home, or connect with the online community on Facebook, Twitter, and Instagram.